Yeah, I don’t know I think I live on words, fancy super-POW words, the sustenance for my being ;) but soup can be a good life booster too. I finally picked myself up off of my bed this morning, dressed, ate something that would pass as breakfast (kiwi and strawberries with a cup of tea) helped Mars get ready for school, fed her, and then headed out for our commute to school and work. Being gone two days garnered 200 work emails, 3 messages on my work phone and 4 missed calls on my cell. My work cell is forwarded to my home cell because the first week I had to take care of two phones I lost the work phone… yeah, that’s me :) But I did not answer my phone while home sick, meaning I was really sick. However, after dropping Mars off at school I then had my first awakening of, no matter how you feel, you’re working now. So I answered and proceeded to continue driving to work, silently professed thank yous to the parking gods as I pulled into rockstar parking, so close it could almost pass for valet…if we had one (side note, GREAT idea and an espresso shop in the lobby wouldn’t be a bad idea either, just sayin!) I thought I’d be there for half a day but ended up putting in almost a full day and I forgot to take a lunch. Which isn’t odd except I didn’t have any hunger pains reminding me of such (at that moment, I usually eat at my computer), about 6 hours in I ate a couple of cashews and almonds realizing it was 5pm. Packing up I was ready to head home, relax and make some chicken noodle soup. To me chicken noodle soup is like chocolate chip cookies, warm fuzzy blankets and the show Friends, it’s like settling into the warm embrace of home. This “recipe” comes from my former mother-in-law, although she’s not former anything other than legality or paper and to me, paper doesn’t matter and the law is not love. It’s love that connects us, the years of bringing each other into one family life. From making homemade liqueur, bay leaf holiday wreaths, Mars’ baby quilt and many meals prepared with love. She’s a strong feminine force in my life and I’m thankful to be able to still have our relationship. Love is the key ingredient for meals from the heart that hit that spot, feeling like home. Like the movie “Chocolat” you can impart a little piece of yourself, your feelings, your soul into what you cook and as a result another who consumes the meal. 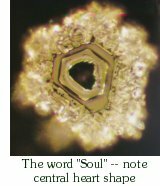 If this sounds a bit hokey to you, and I don’t judge your feeling this, have you ever seen the photos by Dr. Masaru Emoto? 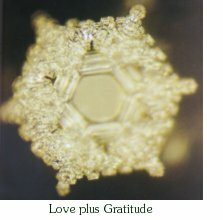 The author of “Hidden Messages In Water” and photographer of water crystals after exposed to a spoken word or phrase, either with maleficent or beneficent intent? Truly he feels that there is spirit in water, in that water is a messenger bridging the physical world with the spiritual. What he’s really showed is a secondary result of a primary truth in that we share a frequency, all of us living and water is living; everything here is living in some way, in some form. Spiritual in physical connecting us in a divine matrix or like my elemental Soie in Glow. I have to admit I’ll have to come back to this as my dear spiritual mentor, Lou (or Mr. Hogan as in the physics teacher who just knows physics in Glow) is still helping me process physics as while I may just know or be knowing of things, physics is not one of them. Lou, however, true to how he was written, just knows physics. He never went passed a High School education but was education or learned from an entirely different mechanism, that of just knowing the answer and intuitively how to find his way through projects and processes. He worked for the Department of Energy for years alongside many that had at least a doctorate, but his abilities allowed him to work with them, often understanding more than those with the “paper” to prove it ;) I’ll come back to him later as he’s a mentor and spiritual messenger still very much an active part of my life. Before I forget, he has a book coming out called Soul Search(ing) and you can bet your bottom dollar when it’s ready for purchase, I’ll feature it here on my blog as I’m quite proud of him and that piece of work; it’s an outward reflection of the forces bringing he and I together as we navigate our paths here in this endless wake of today. Haha, I bet you’re wondering about the chicken soup, huh? Well, first this is chicken soup from the soul so it’s really me throwing some words attcha and seeing if I can help nourish a little interest or perhaps a sense of home in sharing a few things I find quite fascinating. The truth is I don’t have a recipe really for the soup, I made it, took pictures then told my friend Elijah that I needed to figure out how I made it to be able to share the “recipe” …the paper. But in truth, it’s much like how I write; I wing it. I just sit and write. Often with recpies that are like home that’s how I cook. I just pull out some veggies, chicken, chicken or veggie stock and noodles then cut, chop, mix, sauté, add a little bit of oregano, dash of basil, pinch of Cajun seasoning (I put that in a lot) and voila…soup! Or type this word, throw in that phrase…follow the yellow brick road unfolding in my head and voila..blog, or voila Glow. A bunch of veggies… lol. Okay I used a medium head of broccoli cut into the cute little florets, 5 mushrooms sliced, one little zucchini cut in slices, baby carrots cut diagonally for effect, 2-3 stalks of celery chopped in to chunks, and 2 garlic cloves minced. 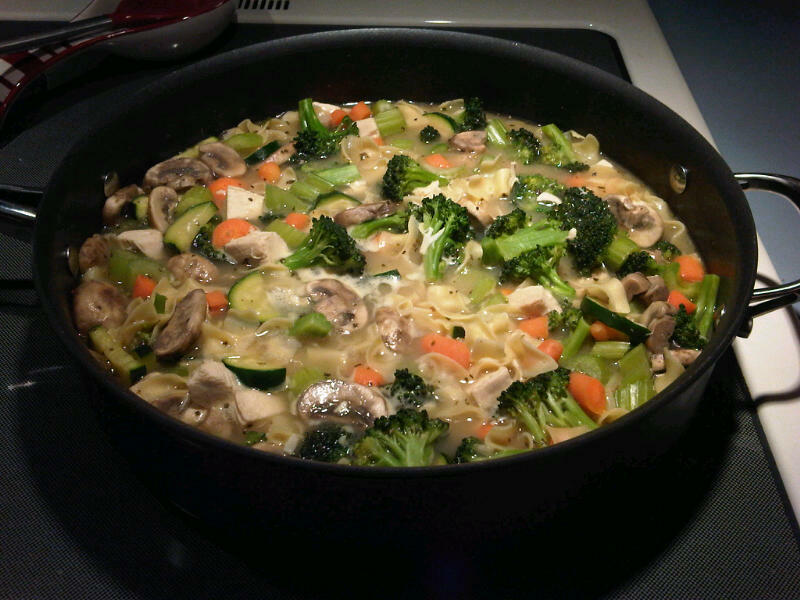 I put about a tablespoon of olive oil in a deep saute pan and sauteed the veggies for about 7-10 minutes, then added 2 small chicken breasts in cubes (from an organic rotisserie chicken), about 48 oz of chicken stock/broth, and half a bag of the No Yolk egg noodles. Let this heat to a boil then let simmer until the noodles are al dente. (I like my veggies vibrant in color and not too soft, so cook further if you like yours done more). I then added salt, pepper, oregano, basil and a dash of cajun to taste. Being to taste don’t be afraid to actually taste and feel what the soup needs. Hmmm, that recipe sounds about right and just like my (former) mother-in-law taught me, when stemming from love (and a little improvisatrice) it’ll taste delicious. 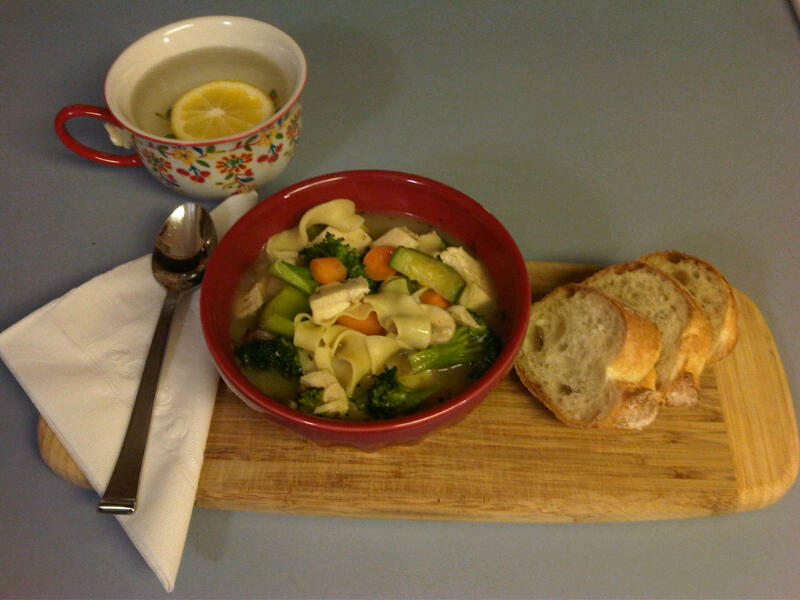 Dish up and serve with some crusty bread and tea or in my case, lemon water. Enjoy!